Hi and thanks for reading. Me and my wife (The Fish – not because she drinks like one!) love wine and I spend most of the time when I’m not sleeping or working either talking about, reading about, or most importantly, drinking wine. I have my favourites, which I will write more about, but am always prepared to try and learn new things. I love reading other people’s views on wine and I hope you will enjoy and appreciate mine. I’ve enjoyed drinking wine for a fair few years but really got into it seriously and passionately a couple of years ago. I used to spend time perusing the shelves in the supermarkets but then I started reading more about wine and looking for new places to buy this magic in a bottle. I discovered Majestic and a whole bunch (sorry!) of new grapes and wine regions and then I came across an independent wine merchant who totally blew the whole subject wide open. I met Jez at Wine and the Vine a few years ago after walking into his showroom at Battlers Green Farm in Radlett. I thought I would choose a couple of bottles for the weekend and didn’t realise the minimum quantity was 12 in a mixed case. Me and The Fish had a chat and decided why not, let’s give it a go. We told Jez that we liked Chianti and Rioja (don’t we all at first!) and were fans of Riesling and Gewurtztraminer so he pulled a few off the shelf to get things going. We then tasted some of the wines he had open for sampling and were blown away by the white grapes of Verdejo and Torrontes… This was all new to me and I loved it! So that’s how it started. I promise I will write more about Jez and his shop over the next few months. The second big event for me was when The Fish asked me what I wanted for my birthday a couple if years ago. I thought about a case of wine, then I thought, how about spending a bit more and having 2 special bottles? This was the biggest mistake I ever made financially because now I have a very expensive habit! Those two wines were a Nicolas Rossignol Volnay 1er Cru En Chevret 2006 and a Henri Bourgeois Sancerre Cuvée Jadis 2009. The Volnay was a magical experience and remains my favourite wine appaletion, the Sancerre demonstrated how subtle and interesting Sauvignon Blanc can be, and its not always about in your face tropical fruit and harsh acidity. I did some WSET stuff and I just love to keep learning. 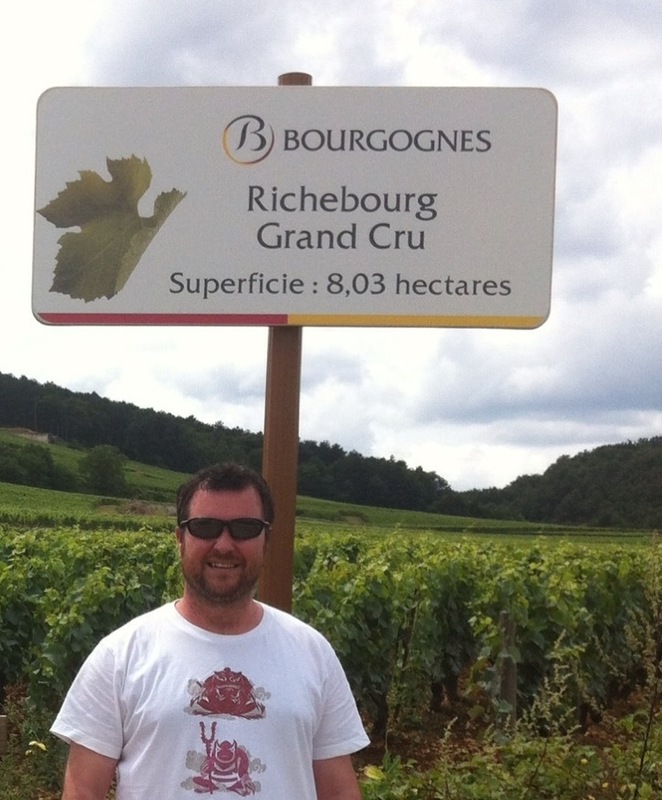 In February 2012 we drove to Beanue for 3 days and set up a personal tasting with Nicolas Rossignol of the ethereal Volnay fame, amongst others. It was an incredible three days and on the way home we started planning our 2 week summer holiday. And so the planning began… The Rhone Valley, Burgundy, Champagne. And what a two weeks it was. While we were on the trip I wrote a series of email postcards to our friends and family and they all said how much they enjoyed reading about our wine adventure. A couple of them even suggested I should write a blog… So here I am. The first post will be a re-hash of those e-cards. I hope you enjoy reading them as much as I enjoyed writing them, and I hope you enjoy the rest of the posts. Thanks for reading, enjoy, and cheers. Thank you so much… Italy is on my list to get to know better in 2014… I hope you can help!